Magazines and talk shows declare that women will be happy once they've discovered who they are and find the right friends, the right man or the right job. No doubt these things will bring temporary happiness, but in order for women to find true contentment, they must look to Christ alone. Only He is the source of their meaning, value and identity. Debra Evans exposes the myth that women can find their fulfillment anywhere else, and proves with solid biblical evidence that Christ is the love all women long for.The major distinctive of this book is its interactive nature. Fill-in-the-blank exercises, journaling, Bible studies and questions are blended with diagrams, anecdotes and biographical sketches to help readers learn how to revel in the extravagant love of Christ and enjoy total satisfaction in Him. - Publisher In order for women to find true contentment and meaning, they must look to Christ alone. Through this highly interactive book, Debra Evans exposes the myth that women can discover fulfillment anywhere else. Using solid biblical evidence, she shows how Christ is the love all women long for. Fill-in-the-blank exercises, journaling, Bible studies and more are blended with diagrams and anecdotes to help readers learn how to revel in the extravagant love of Christ and experience soul satisfaction in Him. 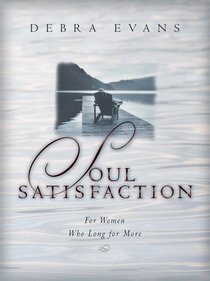 In order for women to find true contentment and meaning, they must look to Christ alone. Through this highly interactive book, Debra Evans exposes the myth that women can discover fulfillment anywhere else. Using solid biblical evidence, she shows how Christ is the love all women long for. Fill-in-the-blank exercises, journaling, Bible studies and more are blended with diagrams and anecdotes to help readers learn how to revel in the extravagant love of Christ and experience soul satisfaction in Him. Debra Evans is a freelance writer, editor, and writing coach who has worked with renowned authors and teachers, including Debbie Ford, Nicole Daedone, and Barnet Bain. As former national Director of Conference Programming for Whole Life Expos, Debra has worked with New York Times best-selling authors, including Wayne Dyer, Deepak Chopra, and Marianne Williamson.